I can tell you what I'm working on. Sort of. Anyone who has called the house in the past week -- and for those of you who have called in the evenings this past week to keep me company while Jeff's working insane-o hours, I thank you dearly -- knows that I've been hard at work on a quilt. Here's the problem: technically, I shouldn't post pictures. Why? It's intended for someone whom I know reads this site. I should have started this project years ago, but I was too chickenshit to do it. 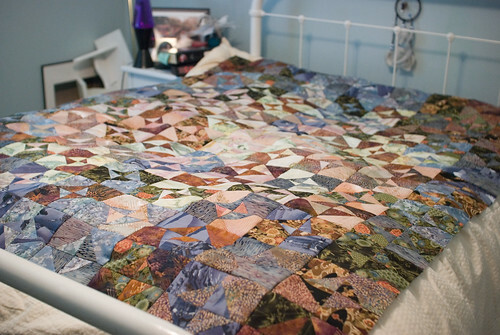 Years ago, on a visit to Heather and Andy, Heather offered to assemble a quilt top for me if I bought the fabric. I did, and she started working on it, but life eventually became too busy and she sent the pieces back to me, with all of the instructions and equipment I'd need to get started. The box held enough fabric and squares to do at least two quilts. 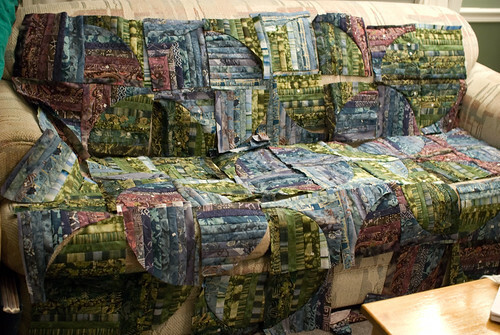 Read more about technoquilting complete!